Russia has added two golds to its medal tally on the fourth day of the world rhythmic gymnastics championships, taking place here in Moscow. Spectators filled the Olympiyski Arena in Moscow to watch their favorite gymnasts perform the last day of qualifications for individuals in the Ball and Ribbon events. Evgenia Kanaeva faced few problems handling her ball and easily won the gold medal. The Olympic champion performed a near-perfect routine and left her compatriot Daria Dmitrieva in her wake. “I'm pleased with the way I performed today. But there were a few mistakes, so I still have to train so I can improve my performance for the All-round Final,” Kanaeva ssaid. It was too tight for the strong Russian trio in the Ribbon competition and Kanaeva did not qualify for the final due to the limit of two athletes per country. It seemed like Daria Kondakova would win the decider after she took a confident lead. However, Dmitrieva, who was the last to perform, had a different idea and her powerful and passionate routine impressed the judges with its incredible speed and dramatic choreography. Third place was booked by Aliya Garaeva of Azerbaijan. That was her second bronze medal of the night. “We do not compete against any particular gymnast, firstly we are fighting ourselves. If you can cope with your emotions and if you are in good form you will get what you deserve. And I think I did today,” Garaeva commented. Russia's dominance at the World Championships continued as the hosts secured two gold and two silver medals. 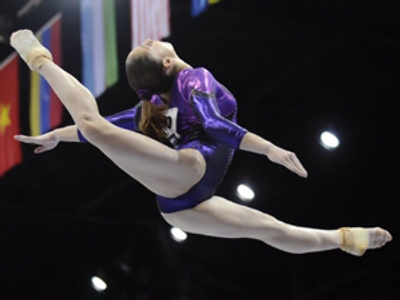 And on Friday, spectators will see the start of the reputable Individual All-round Final featuring the 24 best gymnasts.